Sometimes simply asking for help can change everything. Say you’ve started a garden and it’s not thriving. You’ve checked out all the books from the library, logged hours on the internet, watched the gardening programs on TV, but nothing answers the specific issue you’ve got. At a local garden show, in desperation you turn to a real, flesh-and-blood expert, and after a few moments’ conversation, the problem is on its way to being solved. Chances are, the person who just helped solve your problem was a Master Gardener. Master Gardeners are ordinary people with an extraordinary love for plants and a zeal for helping people. Each Master Gardener has received over 50 hours of training from UF/IFAS Extension faculty in botany and horticultural sciences and performs 75 hours of volunteer work in their first year, with an additional 10 hours of training and 35 volunteer hours each following year. Master Gardeners work with schools, garden clubs, nurseries, charities and city planners to make our communities more livable, more sustainable, and more beautiful. All you have to do is ask for their help. In fact, it was asking for help that brought the Master Gardener program into existence in the first place. In 1971, Extension agents at Washington State University found themselves overwhelmed with calls from new gardeners. Economic inflation had created a new generation of consumers who wanted to cut their food budgets by growing their own vegetables, and they had questions—lots of questions. Attempts to solve the problem by developing radio and television gardening shows only made the public more aware that the Extension office was the place to go for help. Feeling they were in over their heads, agents David Gibby and Bill Scheer began to explore the idea of recruiting and training volunteers to help conduct plant clinics and answer questions. In 1972, trial clinics at a mall in Tacoma convinced them that there was an enormous public response to volunteer help, and a year later, WSU Extension was training its first class of volunteer horticulturists. After 55 hours of training, volunteers became certified Master Gardeners. The title “Master Gardener” was borrowed from the German “Gartenmeister,” a term for those with high proficiency in the horticultural arts. During its first five years, the Master Gardener program grew to include 400 volunteers from 8 Washington counties. 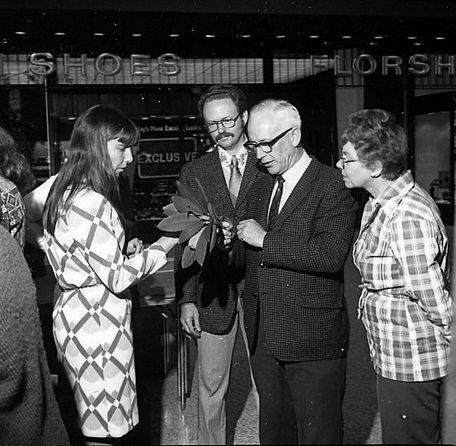 WSU Master Gardener Sharon Collmen, left, answers gardening questions at a Seattle area mall, 1973. Meanwhile, in Florida, Extension agents were facing a similar problem, as increasing numbers of “inflation gardeners,” frustrated by their lack of gardening skills and knowledge, turned to Extension for help. In the early 1970s, most county extension offices had few agents with horticulture experience, and those that did focused on Florida’s commercial horticulture industry. Recognizing the need to help home gardeners, Extension partnered with the Florida Seedsmen and Garden Supply Association to train garden supply store employees. Running from 1972 to 1978, the program was well-received, but it had the effect of actually escalating the number of calls to Extension offices. Other attempts—at mass media, “telelecturing,” accelerated hiring—only resulted in an increased demand for Extension expertise.Then in 1975, UF/IFAS vegetable crops specialist James Stephens was escorting a group of 4-H and FFA students on a boat tour of Kings Island, Mississippi when a USDA agent told him about the Master Gardener program in Washington State. This was followed in 1977 by a trip to the Pacific Northwest to see the program in action. By that time, the WSU’s Master Gardener program had caught on in Oregon, Colorado, Montana, Alaska and New York. 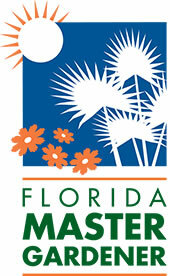 Finally, in 1979 the Master Gardener Program got under way in Florida. 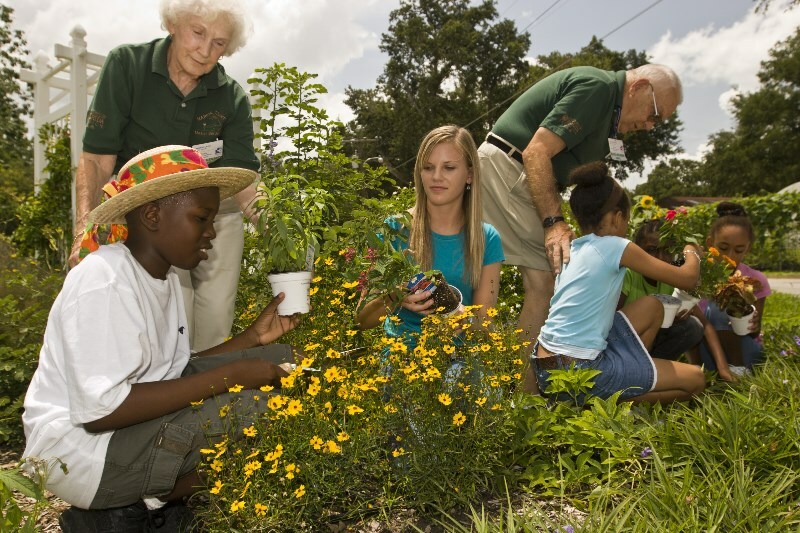 That year, 58 trainees completed 8 weeks of instruction to become certified as Master Gardeners and began volunteer work in Brevard, Manatee and Dade Counties. Many in that first graduating class far exceeded their volunteer service requirements, with two Masters Gardeners in Manatee County performing between them a total of 450 hours of service! In 1995, Master Gardeners in Dade County helped to create a community garden in one of the most crime-ridden neighborhoods in Miami. The 62nd Street Project began with an Extension agent and a Master Gardener standing on the sidewalk, asking anyone passing by if they’d help build a garden. By the end of the day, members of the community threw in to clear out debris and organize plots. Soon students from the Morningside Elementary School got involved, and a Garden Board was formed, composed of residents, American Legion employees, City Police and a Miami businessman. The 62nd Street garden opened in the fall of 1996. In the late 1990s, Orange County Master Gardeners began a partnership with Habitat For Humanity to plan, design and plant landscapes for new homes for low-income residents. In 2009, Duval County’s Master Gardeners teamed up with the Northeast Florida Society of St. Andrew, a nonprofit hunger relief organization that works with area farmers and grocery stores to glean food for local food banks and homeless shelters. Nine master gardeners spent 117 hours picking and distributing 30,128 pounds of citrus fruit, including tangerines, lemons, oranges, grapefruit and kumquats. Master Gardener Ruth Micieli, right, offers gardening advice to a visitor at the EPCOT Center in Orlando, 1998. For more information about the Florida Master Gardener Program, visit UF/IFAS Gardening Solutions. Bradshaw, J.P. 1997. The Master Gardener Volunteer Program: Then, Now & Beyond. Proc. Fla. State Hort. Soc. 110:396-402. Gray, S.D. 1980. 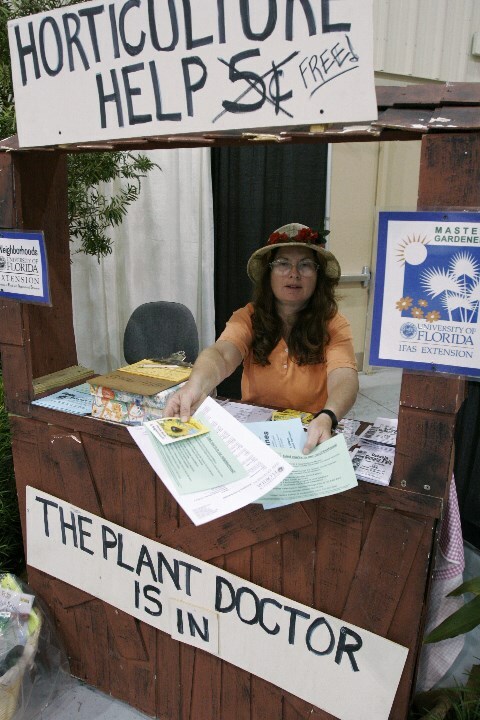 Florida’s Master Gardener Program. Proc. Fla. State Hort. Soc. 93:103-104. Schneider, M.L. 1996. Master Gardeners Providing Poverty Pockets of a Large Urban County with Ornamentals Using Volunteers. Proc. Fla. State Hort. Soc. 109:17. Stephens, J. M. 2002. 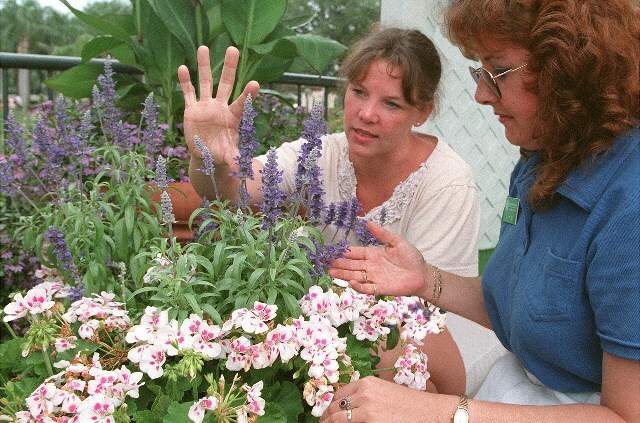 Florida Master Gardener Program: A Brief History. Proc. Fla. State Hort. Soc. 115:143-145. Darryl Palmer is an editor at UF/IFAS Communications.